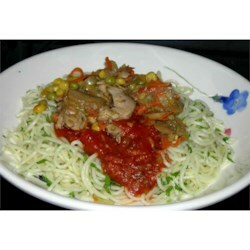 "Chicken breast sauteed with mushroom, bell pepper and onion, then stirred into hot angel hair pasta and spaghetti sauce. A tasty, quick and simple recipe that I received from a friend. Serve with garlic bread, if desired." Heat oil in a large skillet over medium high heat. Saute mushrooms, bell pepper and onion until soft; remove from skillet and set aside. Saute chicken for about 15 minutes, or until cooked through and juices run clear. Return mushroom mixture to skillet and stir all together. Return pasta to pot over medium heat and stir in spaghetti sauce; heat through, then stir in chicken mixture and heat through, stirring. Serve hot. Chicken in spahetti was actually very good. It was a nice change. Very Tasty! Awesome! Quick and easy, yet tastes like something you would order at a restaurant!